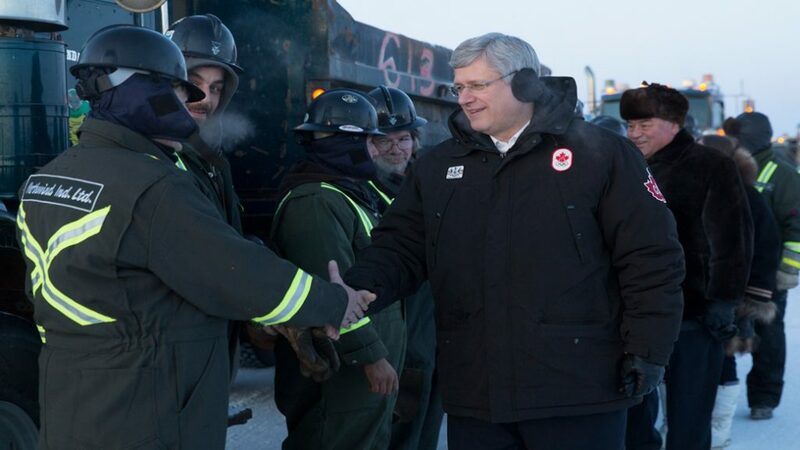 On January 8, in Inuvik, Northwest Territories, Canadian Prime Minister Stephen Harper presided over the groundbreaking ceremony of the extension of the Dempster Highway to Tuktoyaktuk, on the Arctic Ocean’s coastline. The extension will lengthen the highway 137 kilometers, finally bringing an all-weather road to Tuk. The existing road, which opened in 1979, stretches 730 kilometers from Dawson City, Yukon to Inuvik, crossing the Arctic Circle and several rivers in the process. Ferries allow vehicles to travel across the Peel and Mackenzie Rivers in the summer, when they are not frozen. The extension of the project will cost an estimated $299 million, with the federal government paying 2/3 of costs. The Government of the Northwest Territories will pick up the remaining third, though there are some concerns that due to potential cost overruns, they will have to pay for a larger amount than anticipated. Road construction will employ an estimated 150 people annually, bringing new jobs to the region. Construction is slated to finish in 2017 or 2018. Fast forward over half a century, and despite increased awareness of the people living alongside resources in the Arctic, the development of commodities is still the real impetus for bringing infrastructure to the north. 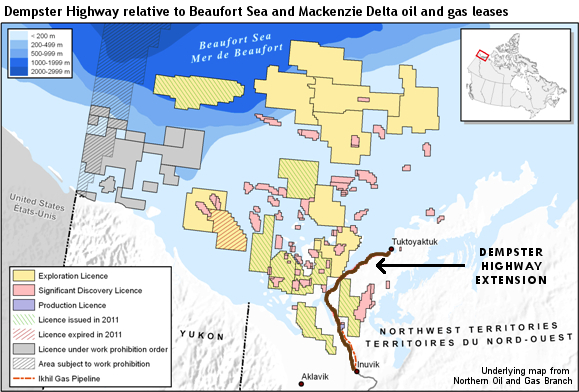 As the Globe and Mail explains, the all-weather, 24/7 highway will be “an engineering feat that should reduce the costs of petroleum exploration in the Beaufort Sea.” The highway has long been nicknamed the “road to resources.” To be fair, the ~930 people living in Tuktoyaktuk will probably enjoy a lower cost of living once the road is complete, as it will be easier to truck supplies in and out. During some parts of the year, the community is only accessible by ice road, barge, or air. A study (PDF) by the Northwest Territories’ Department of Transportation found that the cost of living savings would reach $1 million for people in Tuktoyaktuk, and about $1.5 million including savings on Food Mail. 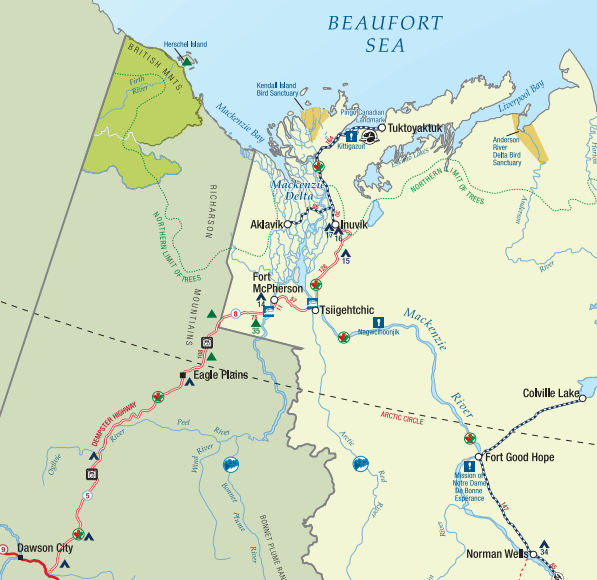 Other local residents and organizations, such as the Inuvialuit Settlement Region, will also profit from benefits as royalty payments on the gravel laid down for the all-weather road. Yet when you do the math, these amounts of money do not really justify the federal and territorial governments spending $300 million to ostensibly better connect a community in the north to the to the rest of Canada and “improve the lives of people living in the North for generations to come,” as Harper claims. Adjustments to original Northern Oil and Gas Branch map by author. The $300 million in spending, however, does make sense in light of Harper’s strategy to cement Canada’s status as an “emerging energy superpower,” as he stated in 2006. The real beneficiaries of highway to Tuk will be the oil companies. They will save much more than the $1 million saved by the hamlet’s residents. Bob Ball, BP Operations Manager, North American Arctic Exploration, estimated that the all-weather road could reduce the company’s total cost of operations in the Beaufort Sea by 15%, as the road will facilitate overland transport during the current shoulder seasons of spring and fall. The 2010 study by the NWT Department of Transportation also looked specifically at how the road would benefit the Mackenzie Valley Pipeline. Though the project is currently on hold, road construction would have delivered $20-30 million in total increased revenue to the federal government. The oil companies, in contrast, would have received some $347 to $516 million in additional cash flows over 45 years – a disproportionately large benefit. Indeed, the road is key to Harper’s plan to bolster northern sovereignty. As the press release issued by the Prime Minister’s office reminds, “The initiative is in keeping with two key objectives of Canada’s Northern Strategy: ‘Promoting Social and Economic Development’ and ‘Exercising our Arctic Sovereignty.” As in other Arctic countries like Russia, which is constructing search and rescue stations along its Arctic coastline and rebuilding old airfields, and Norway, which moved its armed forces’ headquarters from Oslo to outside the city of Bodø in 2009, physical presence in the form of permanent infrastructure is important to continually promoting sovereignty in the remote north.